An historic trip to explore the Pearl River in the Guangdong Province of China has made Feadship’s 45m motor yacht Helix the first superyacht to navigate this famous river delta. She berthed in the city of Nansha, where European traders kept Folly Forts in the 17th Century to trade with the mainland Chinese. Today Nansha is a thriving metropolis and was the ideal location for the city’s first boat show, which took place in early October and where large crowds admired Helix’s level of quality. Launched in August 2011, Helix offers a proven platform, with an established hull, superstructure, and exterior styling and her ‘Nautical Style’ interior has been selected by the shipyard, with traditional dark woods combined with neutral tones providing a warm and distinguished atmosphere. With excellent volume and spacious living areas inside and out, Helix offers light-filled accommodation for 10 guests all on the main deck plus a convertible office for two on the bridge deck and would be ideally suited to charter operations. The overwhelming feeling of space in the master cabin is created by numerous floor to ceiling windows and exceptional headroom, which opens up to a skylight 3.2m above. Helix was named best displacement motor yacht under 500GT at the 2012 World Superyacht Awards. 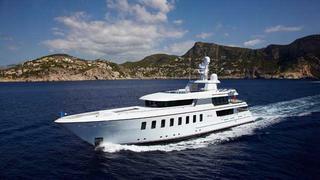 Lloyd’s classed, MCA compliant and fitted with zero speed stabilisers, Helix is asking €33.5 million with Feadship.